Can I just say that I’m so glad the poncho trend is still going strong? They are so cozy, comfy and can be super easy to knit or crochet. 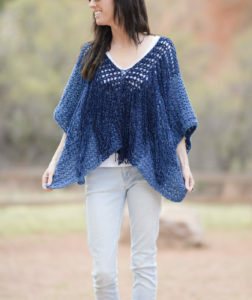 This poncho crochet pattern that I’m sharing today is essentially made up of two rectangles seamed together at the shoulders. It doesn’t get any easier than that! And while it’s simple, it’s also practical and turned out to be quite pretty in my opinion – lol. I really love the Touch Of Alpaca Yarn that I was able to use for this pattern as it looks like a luxury yarn to me. 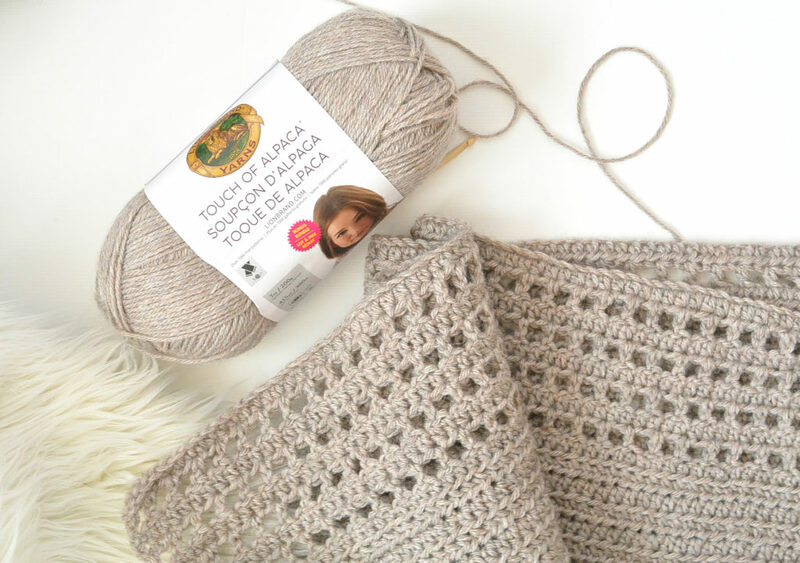 The bit of Alpaca adds a neat texture and I love this gorgeous neutral Taupe color. Neutrals are always my go-to favorites but I did enjoy using this same yarn in multiple colors for the recent Ruana that recently I made as well. 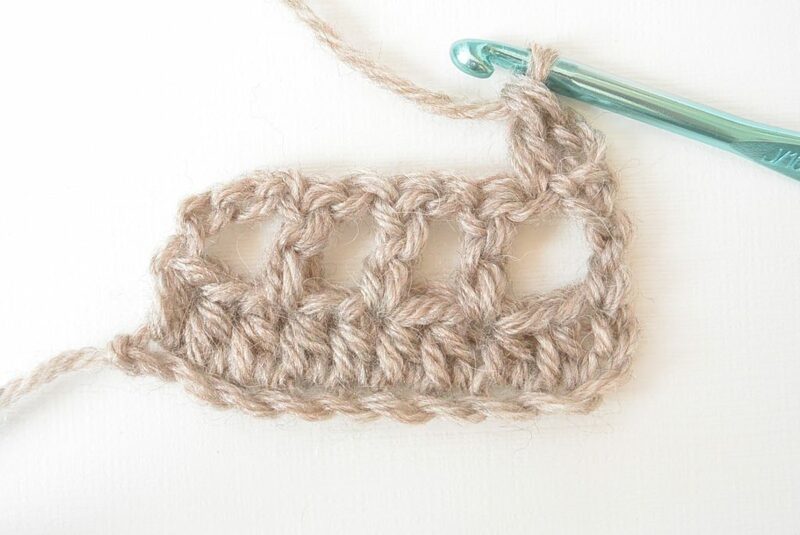 This pattern uses half double crochet stitches and I’ve included a picture tutorial below for the open mesh portion along the bottom. 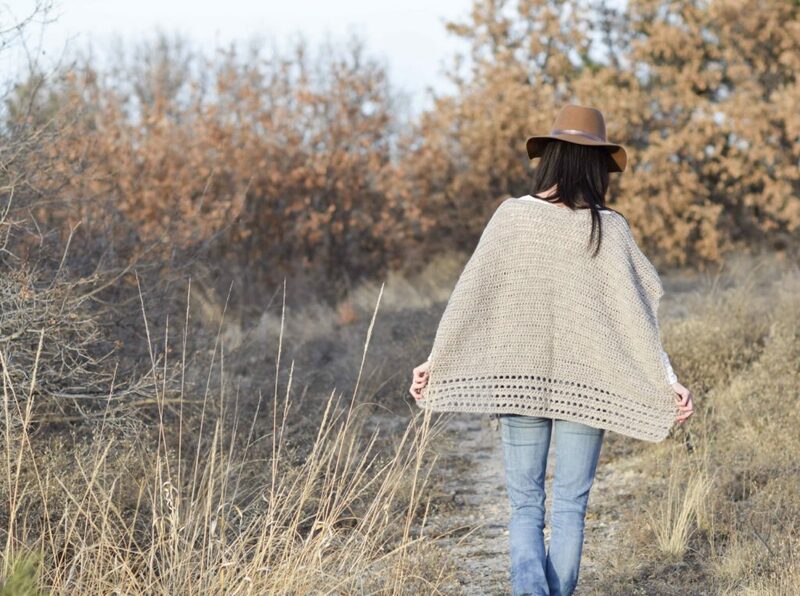 You can scroll down for the free poncho pattern or you can also find the the full kit available for purchase from Lion Brand Yarn here, or a printable ad-free version in my Etsy shop here. 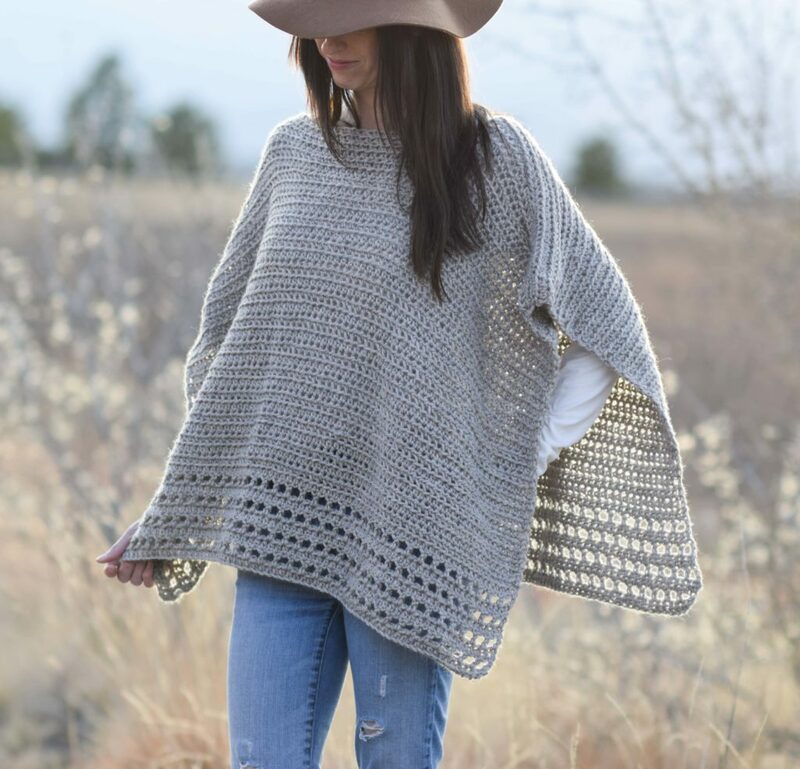 The lower portion of the poncho has simple open-work stitching and the upper portion is made with half double crochet stitches that are worked through the front loop only. I’m really pleased with the clean, modern lines on this piece. It was a lot of fun to crochet as it didn’t take forever (though it’s not the fastest project I’ve done), but the yarn was also lovely in my hands. 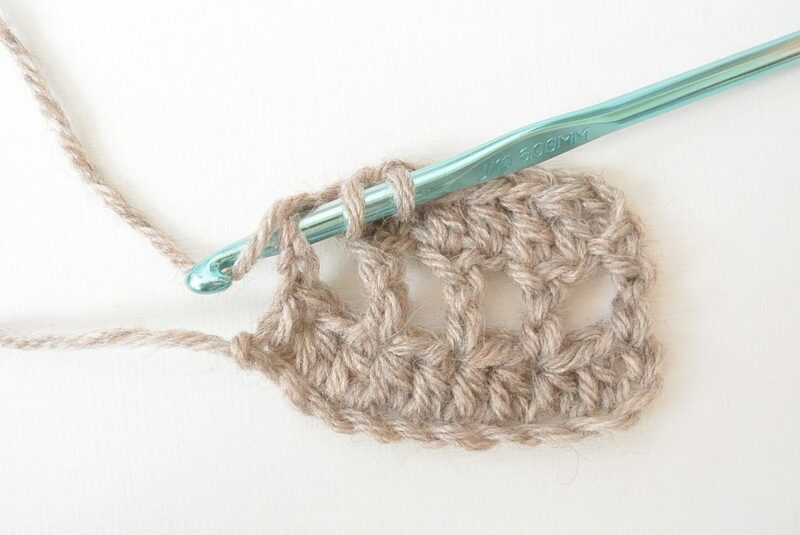 Yet another one of those great, Netflix and crochet mindless patterns! You can find the yarn in regular sized skeins or in the bonus bundle sizes either at Lion Brand’s website, Michaels Website or at select Michaels stores. The bonus bundles hold the equivalent of two regular skeins of the yarn so there’s less weaving in ends. That’s a huge plus for me….no ends please! You wouldn’t know, but it was freezing the day we were out taking photos of my new poncho. 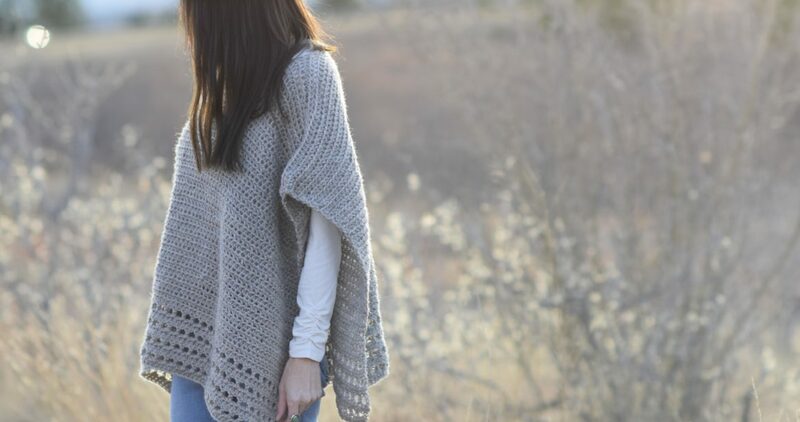 It did cut the chill of the wind, but the nice part about this poncho is that it’s not super heavy so it will work for those of you in slightly warmer climates as well. 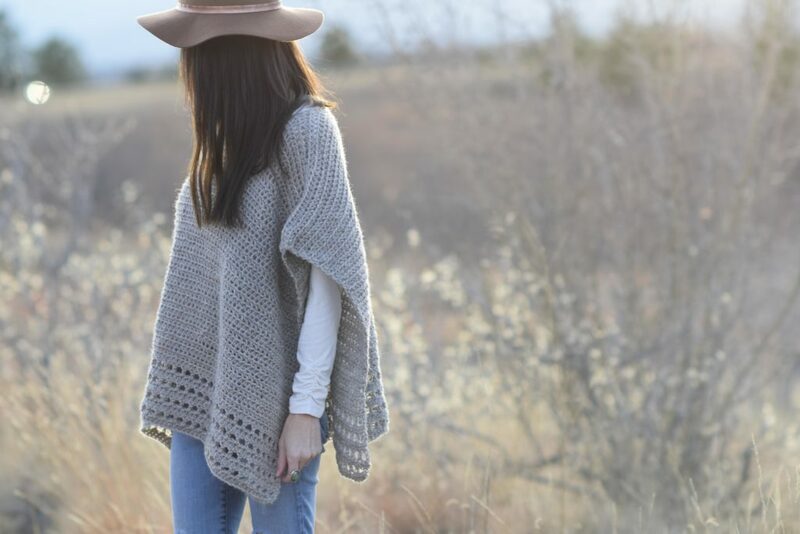 The simplicity of this poncho as well as the clean lines make it a stylish, classic piece. The alpaca blend gives it a soft look and feel while the lovely detail along the lower edge adds interest and breathability. Approximately 31” wide X 22” long – One Size **Please measure yourself to ensure that this size will work for you before beginning my friends. As with any one size piece, the fit will be different on various size bodies. I am a size small and 5’6″ and am pictured in the poncho. If you intend to add length please purchase more yarn than is called for in the pattern. 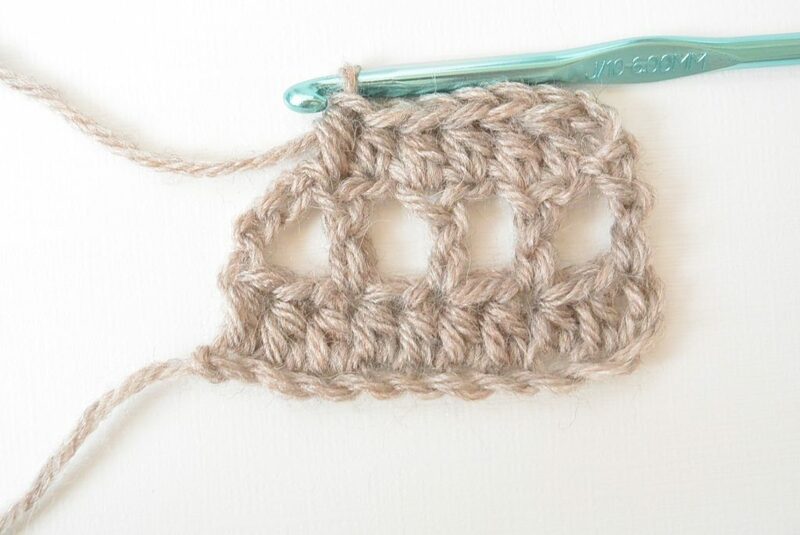 You can make it wider by adding stitches to your original chain, and make it longer by crocheting for more rows to make it longer than indicated in the pattern. Approximately 11 stitches and 8 rows per 4 inches *Important! Check your gauge and adjust as necessary before beginning. You may go up or down hook sizes in order to get the correct gauge. I do tend to be a loose crocheter compared to some people and this is reflected in this gauge measurement. 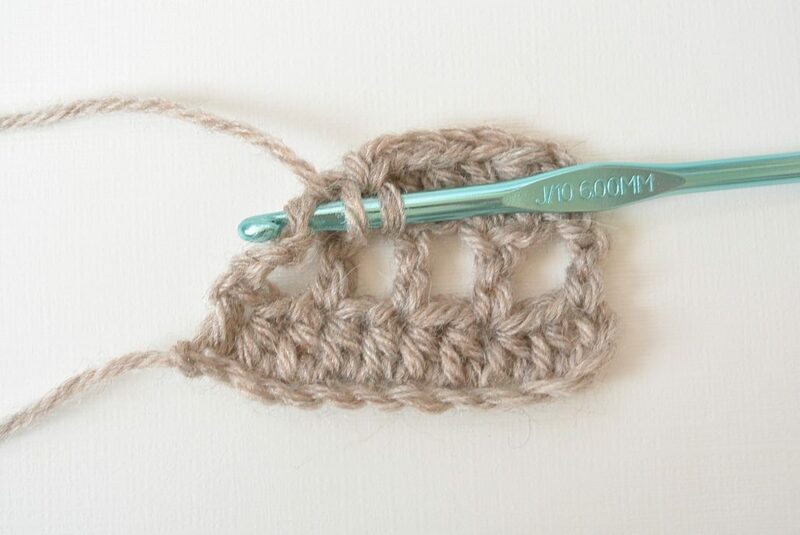 Your size can be incorrect, or you will need more yarn than called for if gauge isn’t correct. 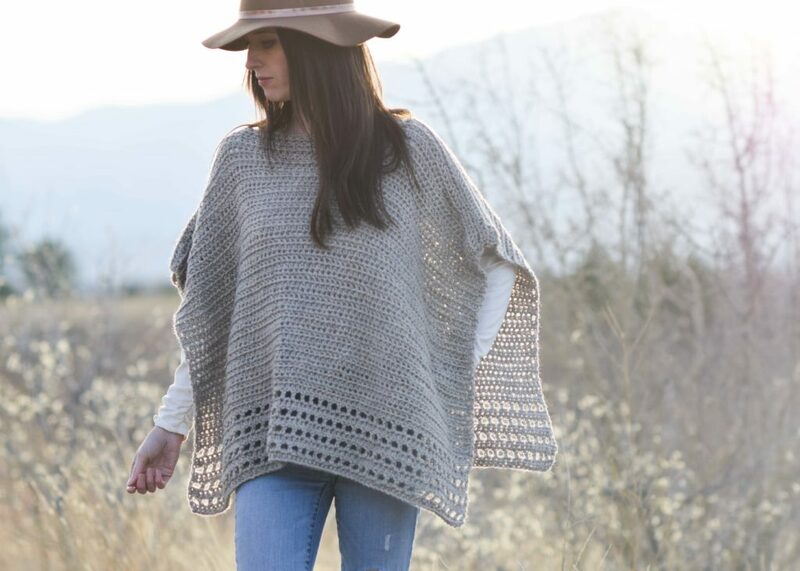 This poncho is made by crocheting two panels and then seaming at the shoulders. Each panel is crocheted from the bottom up. Check your gauge and measure as you go to ensure the size turns out as you’d like. You may adjust the size by changing the hook size or tension. 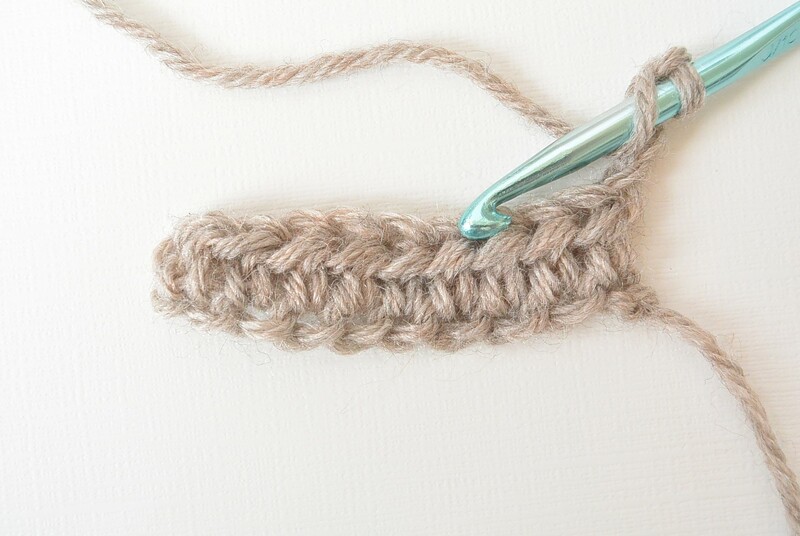 In addition, you can start with a longer or shorter chain but keep an odd stitch count. Keep yarn needs in mind if you adjust the size. See photo tutorial for stitch assistance. Repeat rows 3 & 4 two more times. Next, repeat row 3 for a final time. 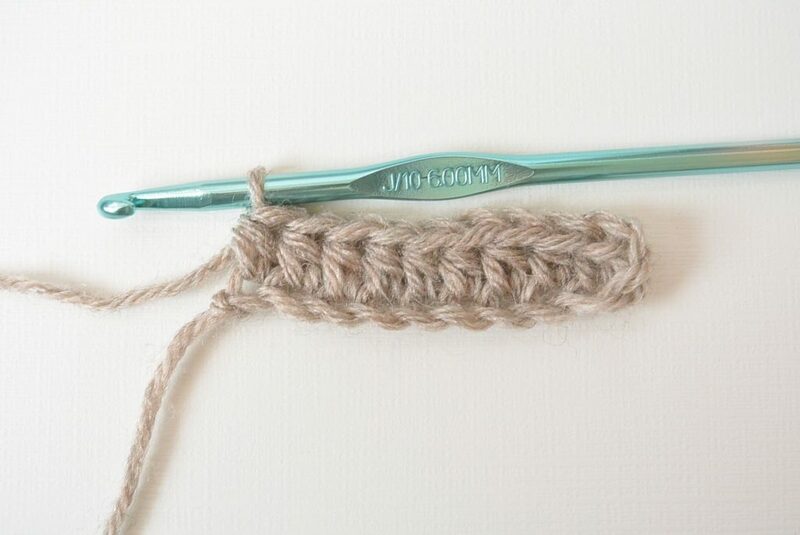 Repeat row 1 until piece measures approximately 22” or you’ve used half of yarn required for entire pattern. Keep a small amount of yarn for seaming at end. Note: You can make the piece longer by crocheting more rows. Keep yarn needs in mind. Repeat above pattern to make second panel. Place panels together. With a length of yarn and your tapestry needle, seam inward at shoulders leaving approximately 10 ¾” space in the center for the head opening. Block as desired. 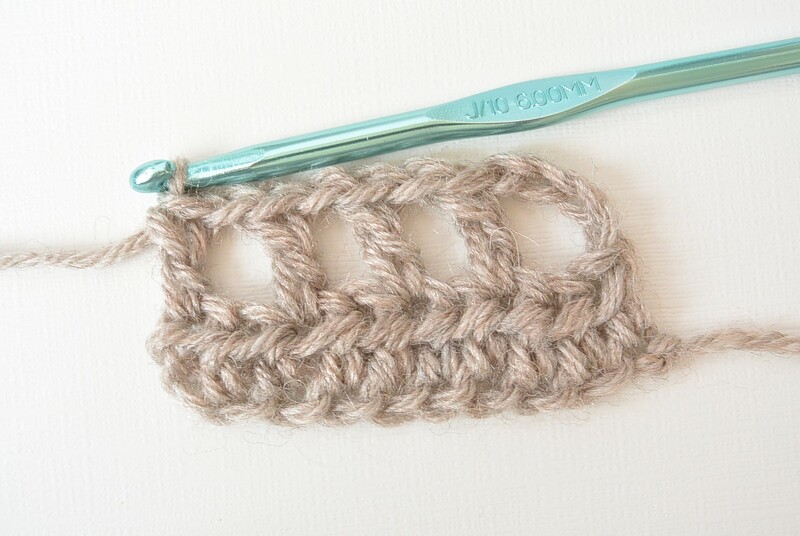 Below you will find a swatch tutorial using the pattern above. Below: Hdc in 4th stitch from hook and each st across row (this includes the ch stitches) If you find it too difficult to work into the ch stitches, you may work into the space. Completed rows 1 – 3 Be sure to count your stitches if you’re having difficulty. 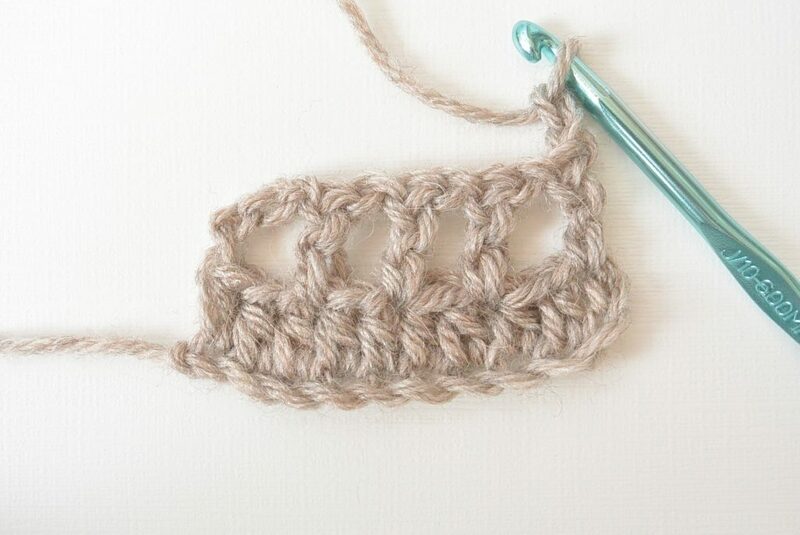 You may also practice on a small swatch such as this. Chain an odd number of stitches and follow the pattern. I hope that you enjoy your lovely alpaca poncho! Happy crocheting and let me know what you think! Thanks Debra! You’re so right. I think it’s a great spring option as it’s not too heavy. Have a great weekend! Any idea if this pattern could or would be available for knitters who do not crochet. Would you have a knitting pattern for this poncho as I don’t crochet. I just got this kit from Lion Brand delivered yesterday. I’m looking forward to starting this after I finish a couple of other projects I’m working on. 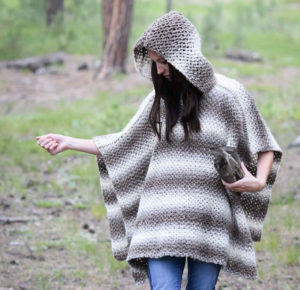 This poncho looks adorable and the Touch of Alpaca Lion Brand yarn is SO soft! Thanks for easy yet stylish patterns. I love your designs! Recieved my Touch of Alpaca yarn in jade last week, so I will be starting this over the weekend! Looking forward to how it turns out. I’d love to hear how it turns out for you! I love that you chose the color Jade. That’s going to be beautiful! Hi Jessica, this is so pretty and I love the color. 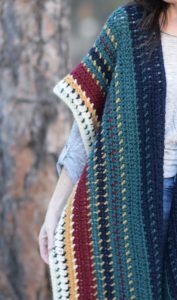 I believe this is one of your few patterns that isn’t made with bulky yarn? Lol I know how much you love it! I have one question what is flo stand for in the pattern? Thanks for this and all your patterns. As always you give us a pattern that looks hard but you make it easy for us. I agree with others that this would be pretty for spring. I ordered this kit, and crocheted the first panel before realizing that my gauge was way, way, WAY off. Even though I was using a J hook and following the pattern exactly, my poncho is only 25” wide, and I was running out of yarn as I reached 22” in length. 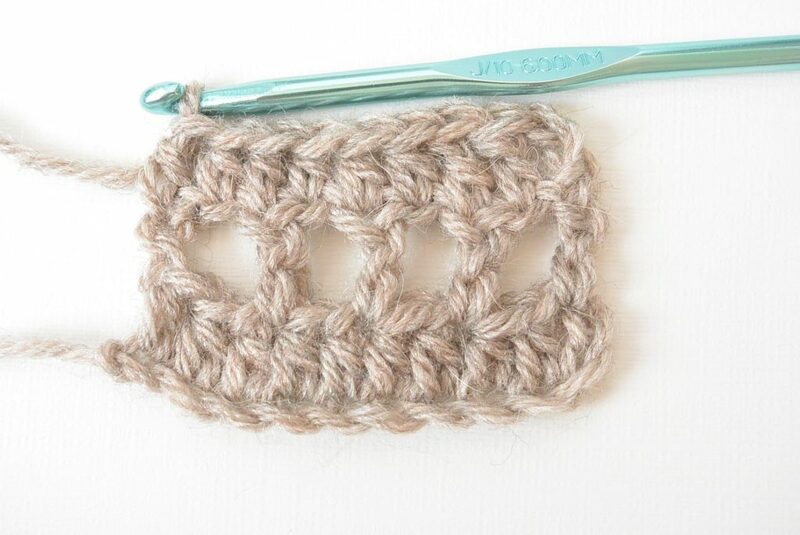 The pattern gauge is 11 stitches and 8 rows per 4”. My gauge is 14hdc and 10 rows per 4” using a J hook (6.0), which isn’t really that surprising based on the yarn label. Once I figure out what hook to use, I’m looking forward to completing this poncho. It’s going to be beautiful! Hi Theresa! Oh that’s a bummer! Gauge sure can throw us for a loop. I am a loose crocheter compared to many people, so I hope if you go up a hook size or two it will work out for you. I will make an extra note here in my pattern ( I usually do) to be sure to check gauge and adjust as necessary before beginning. Thanks for letting us know so others can ensure the same thing doesn’t happen. Theresa, what size hook did you end up using? I started this last night and my gauge is the same as yours. This looks so cute! I’m wondering if you think that 100% cotton would work for this pattern? 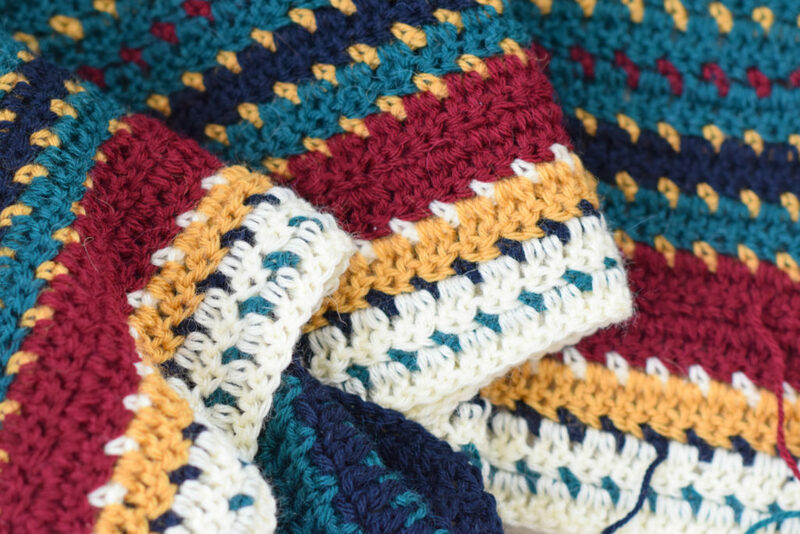 I have some beautiful cotton from Hobby Lobby and I’ve made a few great blankets with it. It’s called “ I Love This Cotton”. I think it would be lovely, though it’s a bit thinner yarn so you may need to go up a couple of hook sizes to get the right gauge. Just a thought! Thank you so much for another beautiful project. I was wondering, what size yarn is the touch of Alpaca? Is it worsted weight or lighter? I’m asking because I wanted to start this but I only have the pound of love on hand, which I would have enough of. Im definitely going to get some alpaca but I want to get started now thank you so much. It’s fairly close to Pound of Love actually, maybe just a touch thicker. You might want to go up a hook size or two to get a similar gauge and try it out! Can you add buttons on left and right sides above the lower edges, maybe 2 on each side as a variation? Absolutely! You can be very creative and that’s a lovely idea. Do you think it possible to do this as one piece? I hate the idea of seam on the shoulder. I’m thinking that once I reach the needed length, I could continue the stitch to approx. 1/3 mark then chain sufficient for the middle 1/3, then take up the stitch again for the final 1/3. That would create an opening. The next row would continue as normal. That 1/3 is just a guess and could easily be altered as needed. You certainly can do it without seaming! The neck does stretch a bit so you do have to be sure you make it small enough that when it stretches it’s not going to be falling off your shoulders or too wide. But yes, you can easily alter it. Do you block all your items you knit and crochet to wear? What are the multiples? I’d like to make a summer tunic with this pattern instead. Sorry if you mentioned the multiples and I missed it. I love all of your ponchos and shrugs, can’t wait to try this one! Love your patterns! Hope to make a number of yhem! Can this be made with any #4 weight yarn? I can’t get the yarn listed locally to where I am without having it shipped, and I’d prefer not to do that. I know it wouldn’t have that “alpaca” feel to it, but has anyone tried it with a different brand of yarn? Does it work well? How can I measure myself to make this in a larger size? Where do I measure myself?